While plastic refuse on land is a familiar eyesore as litter and a burden on our landfills, in the marine environment it can be lethal to sea creatures by way of ingestion or entanglement. Now, an important new study adds to a growing body of evidence that ocean plastic debris is also a threat to humans because plastics are vehicles for introducing toxic chemicals of three sources into the ocean food web. Two of the sources are intrinsic to the plastic material itself, introduced during manufacturing, and have been described in previous studies. The first is the very building blocks of plastic polymers, called monomers, which are linked during polymerization. However, polymerization is never complete, always leaving some monomers unattached and free to migrate out into whatever medium the plastic comes in contact, like foods/beverages or the guts of a sea creature that mistook it for food. Some monomers are known to be inherently toxic, like the carcinogen vinyl chloride that makes up polyvinyl chloride (PVC) plastics, or the endocrine disruptor bisphenol-A (BPA) that makes up polycarbonate plastics. The second intrinsic source of risky chemicals is the brew of additives that manufacturers mix in to impart plastics with desired properties. Additives can have toxic properties of their own (like some softening agents and flame retardants), and they are also free to leach out and contaminate their surroundings. Manufacturers generally consider their blends of additives as proprietary information and secret. Plastic debris from South Atlantic Gyre. Jody Lemmon, Photographer, through courtesy of Algalita Marine Research Institute. A study just published in December in the journal Environmental Science & Technology addresses a third but external source of toxic substances associated with plastics, deriving from oily pollutants commonly found in seawater that glom onto the surface of plastic debris. Plastics are oily materials synthesized from petroleum or natural gas and, in water environments like the ocean, they attract other oily chemicals floating about. This was first measured in 2001 when plastic production pellets (the raw materials of plastic manufacturing) collected from coastal Japanese waters were found to accumulate toxins at concentrations up to a million times that found in the surrounding seawater. 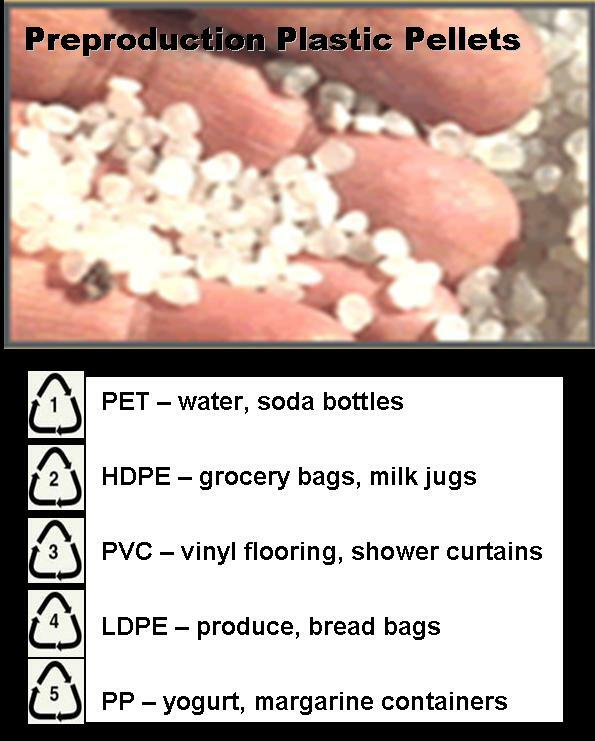 That study was limited to polypropylene (PP) pellets exposed for just 6 days and tested for two types of persistent toxins still common in seawater though banned in the United States in the 1970s and internationally in 2001: DDE (a breakdown product of the insecticide DDT credited with near extinction of the bald eagle) and PCBs (polychlorinated biphenyls, a family of chemicals with widespread electrical applications). The study described here from researchers at San Diego State University compared how readily the five most common mass-produced plastic polymers accumulate hazardous chemicals from local seawater. The findings are especially disturbing given that trawls of the five oceanic gyres around the world (slow-swirling, Texas-sized whirlpools where refuse gathers) are documenting the buildup of alarmingly high densities of plastic debris. 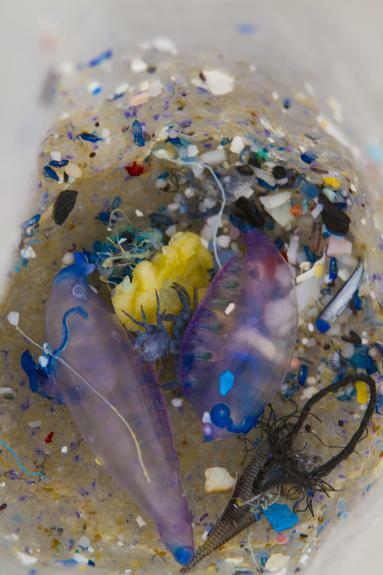 In the so-called “Great Pacific Garbage Patch” between California and Japan, the latest trawls by the Long Beach-based Algalita Marine Research Institute found that plastic debris outweighs zooplankton (tiny creatures at the bottom of the food web) by a factor of 36:1. Plastic is amassing even in areas as remote as the Arctic seafloor. The researchers deposited uncontaminated, preproduction pellets (2-3 mm in size) of five types of plastics at five locations in San Diego Bay, Calif. Samples were recovered for analysis of adhered toxins at intervals of 1, 3, 6, 9 and 12 months. Testing was performed for a total of 42 distinct chemicals falling into two general families of persistent organic pollutants: PCBs and PAHs (polycyclic aromatic hydrocarbons – byproducts of burning fossil fuels or forest fires). All five plastic polymers were accumulators of both PCBs and PAHs, showing increasing concentrations over time. However, three of the polymers (HDPE, LDPE and PP) consistently soaked up both chemical families at concentrations an order of magnitude higher than the other two (PVC and PET), a pattern repeated at all time points and bay locations. After 12 months of exposure for example, there was a 34-fold difference in average total PCBs amassed on LDPE compared to PET at one location. At another site, average total PAHs adhered to HDPE was nearly 30 times that of PVC. The researchers think that differences in the size and shape of the polymer molecules can explain why some accumulate more pollutants than others. As expected, seawater concentrations of PCBs and PAHs varied somewhat over time and between bay locations. Nonetheless, PVC and PET had generally reached equilibrium concentrations of the pollutants by 6 months, whereas the other three plastics had not always reached equilibrium by even 12 months. This is much longer than had been predicted in previous laboratory simulations where polymers were not subject to weathering at sea which produces pitting and other surface irregularities, increasing the surface area available to which toxins can stick. Numerous studies have now documented that ingestion of marine plastic debris is commonplace at all levels of the food web, whether passively by filter feeders, like krill and many fish, or actively when mistaken for food by animals as diverse as sea birds, turtles and whales. All these creatures represent entry points into the ocean food web for toxins either placed in plastics during manufacturing or extracted later from seawater. This study highlights that mass-produced plastics today are all potential vehicles for transporting hazardous chemicals found in seawater, so it will be hard to argue that any one plastic is harmless as an ocean pollutant. As example, PP is often considered inherently less toxic than PVC because vinyl chloride is a known carcinogen, yet PP soaks up far more PCBs and PAHs from seawater. The study authors did suggest, however, that PET might be considered of relatively low toxicity because it generally contains fewer additives and appears to accumulate lower concentrations of seawater pollutants. Another disturbing implication is that marine plastic debris can actually become progressively more chemically hazardous over time as weathering continues to increase the surface area available for gathering pollutants. Analogously, larger plastics debris breaks apart over time into smaller bits, also increasing total surface area. The smaller the plastic debris, the greater the likelihood it can be ingested by the tiniest of creatures at the bottom of the food web. Adding to this concern are studies suggesting that “microplastics” (smaller than 1 mm, e.g.) might be more common and certainly harder to measure in marine environments than readily visible debris. No one has yet analyzed how high are the concentrations of ocean pollutants stuck to such miniscule, even microscopic, fragments. The findings of this study also serve to draw fire to any notion that developing marine biodegradable plastics will automatically eliminate the threat to human health of toxins associated with conventional plastics which are non-biodegradable within any meaningful human timescale. The sole standard established to date for biodegradation of plastics in the marine environment allows that, at 6 months, plastic bits up to 2 mm can remain and that only 30 percent of the original material needs have successfully undergone biodegradation, as evidenced by conversion of carbon into carbon dioxide (ASTM D7081). This standard describes a framework allowing even biodegradable plastic debris ample opportunity to deliver a triple chemical threat into the ocean food chain and maybe even onto our own dinner plates. This entry was posted on Tuesday, January 22nd, 2013 at 2:34 pm and is filed under health, plastics, pollution, science, sustainable living, toxics, waste, wildlife. You can follow any responses to this entry through the RSS 2.0 feed. You can leave a response, or trackback from your own site. Truly alarming. I knew that plastics were absorbing toxins in seawater, but had no idea of the scope you’ve so carefully researched and laid out in this article. So the ocean — the original source of life — is becoming a witches brew of oily chemicals, ancient DDT and PCBs — among many other poisons. How ironic that the ultimate top predator, man, will increasingly suffer the consequences. Thanks for this article. Lays it out more clearly than I’ve seen it before.